The Black-Footed Ferret is a new endangered species we’re going to explore. Exotic diseases are destroying their habitats but they are looking to make a comeback with your help. The Black Footed Ferret is an endangered animal native to North America. They are a species in the weasel family. They grow only to weigh about 2.5 pounds but, like this little guy, can be super aggressive. The Black-Footed Ferret has a large skull and strong jaw with teeth which are adapted for eating meat. 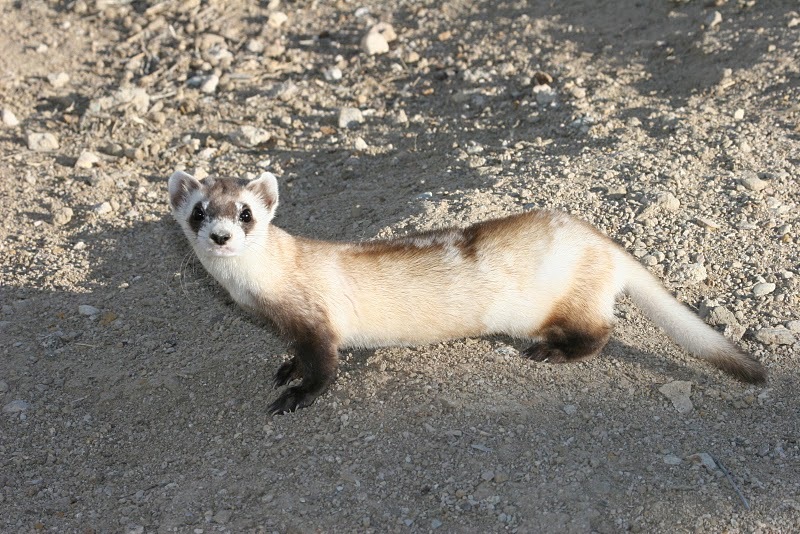 Black Footed Ferrets, though still endangered, have made a comeback in recent years. This one made a comeback to a distinguished modeling career. Black-footed ferrets spend about 90 percent of their time underground, where they eat, sleep and raise their young. Week old Black Footed Ferrets, known as Kits, are born blind and sleep all together in shapes. These Kits are showing you how much they want your love by making a heart shape. This guy is doing a solid Miley Cyrus impression. Their mating season is between March and April. These two are pumping their chests while out on the town searching for some lady Ferrets. These two are starring in a buddy cop film due out next summer. If you want to see the movie please find out how you can help them from going extinct at worlwildlifefoundation.org.